I recently attended a press evening for Etat Pur and was introduced to their full range of products. Etat Pur's products are developed, tested and manufactured by the Naos group, who own Bioderma and Institut Esthederm. Etat Pur have a great way of identifying skincare problems and then finding appropriate solutions. Their aim is to make very high quality products accessible to everyone. If you haven't already done so, you should have a look at their site here. The cream contains ingredients including shea butter and mango seed oil. I can honestly say that I was impressed with this cream. Once you put it on, you can instantly feel a difference. My feet felt really soft and nourished. I love rich moisturisers and this cream does have a rich consitency which is immediately absorbed into the skin. It doesn't leave any greasy residue that you can get with some creams. The cream can be used as often as required but it is best used when applied to clean dry skin. I found that I had to use 2 applications to get my feet feeling moisturised. 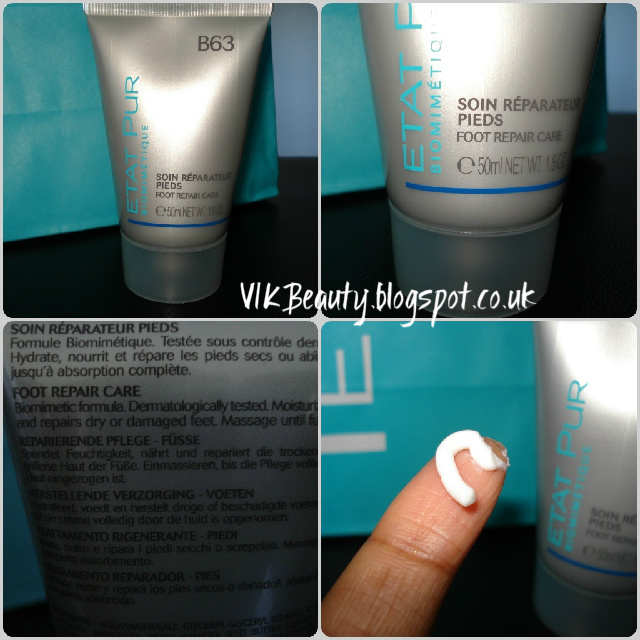 I have been using this cream now for over a week and have almost finished it! It also has a really nice subtle scent. I think this cream is definitely for you if you want to get rid of dry, hard, rough or damamged feet. You can purchase this cream on the Etat Pur site here. The cream retails at £9.90 for 50ml. The cream does it job so I would definitely get it again. Have you tried any products from Etat Pur? Which is your favourite? *This was a PR sample. All views expressed are my own. I love Etat pur products. They are so worth getting because they actually work and like you said you do feel a difference! Looks like a lovely cream! You're right: we tend to neglect our feet during winter. I've never heard of this brand, though. But you've given me a wake up call to start loving my feet more!